On Day 1 of Kraken Con, I would dress up as Tom Nook from the video game Animal Crossing. I was with a group of 4 that were also cosplaying from the same game, but they were coming later to the con so I came in early and got my badge and also helped out one of the Cosplay Senpais that was going to set up their booth inside the convention. 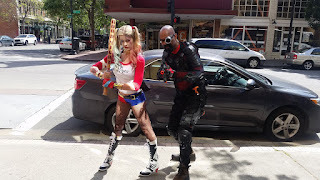 So something new this year is where local cosplayers who have done really well with their cosplays would come to Kraken Con to showcase their works and answer questions that cosplayers have in order for them to be good cosplayers like them. This feature of cosplayers is similar to the one they have in Anime Expo but the focus is on cosplayers around the Bay Area. So with the time I have, I helped her get her table organized and then started to roam around the con. What's new this year is that the con connected both Gaming and Dealer's/Artist's Alley into one room instead of two seperate rooms. The Fan Panels are still upstairs in the 2nd floor conference rooms, and the Main Events Panel is actually behind the Gaming Room. So in all, they opened up more space which helps improve foot traffic for attendees and provide more artists and dealers for this convention. While waiting for my Animal Crossing group, I met up with a friend and we would wander around the con looking for artists and dealers that we know. We also did see CCB convention writer, Robbie Pleasant, who is actually working for Kraken Con this year. I was able to get a chat with him before continuing to see what lies around the con. At around noon, we would lineup to grab autographs for Carrie Keranen who has been the voice actress to many characters in anime and video games including Satsuki Kiryuin from Kill la Kill, Mami Tomoe from Puella Magi Madoka Magica, and Lux in League of Legends. 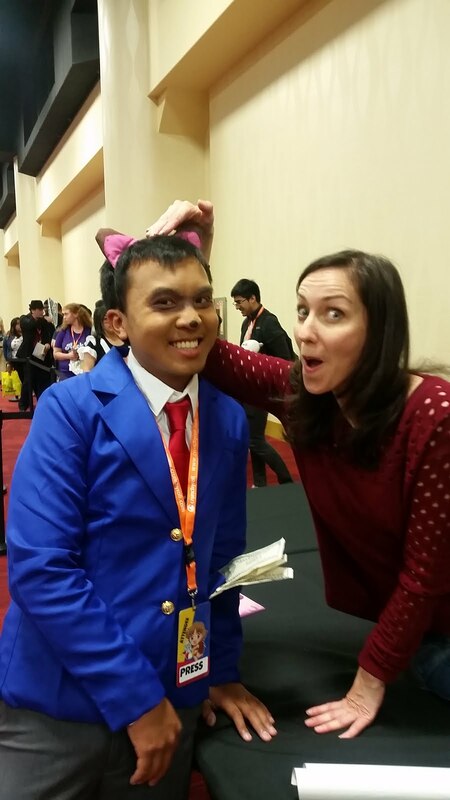 A moment with Ms. Keranen as she looked at my Tom Nook cosplay and she like how I worked with the ears. She actually thought I was cute and actually petted me as a little pet. 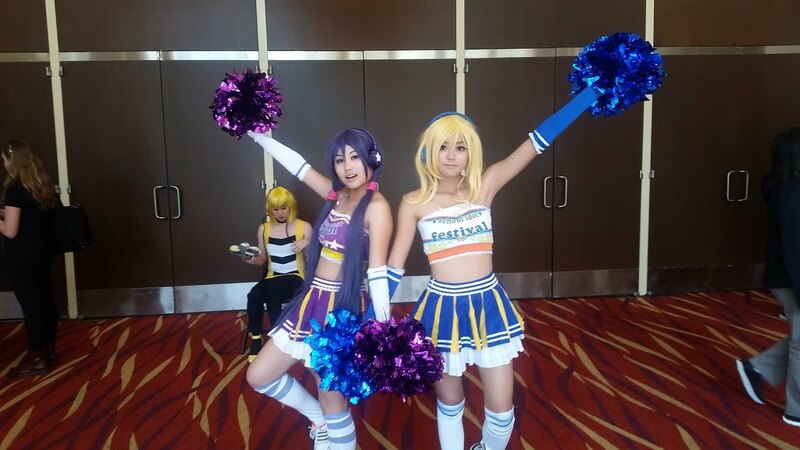 A little funny moment at the con, but I liked it! Around lunch time, the whole group would meet up and we would first grab lunch since we both didn't grab lunch before attending the con. On the street that faces the entrance of the convention center lies a marketplace that has many restaurants in the area. We would go to the place we went to last year that serves great hot dogs and ate lunch there. When we were finished, I would go back to the con at the autographs line to line up for another autograph for a guest at Kraken Con: Karen Strassman. She is also a voice actress to anime and video game characters like Soi Fon from Bleach and Kallen Stadtfeld from Code Geass. But most of us in the Calicon blog are fans of the Persona series, and Ms. Strassman has a remarkable role in Persona 3 as Aigis & Persona 4 as Nanako Dojima. We waited in line for about 45 minutes until our turn is up. Now one of my friends in line drew the character of Aigis on a Magic card as she has done drawings on Magic cards for a while. She was the first to come up to the table and when Karen Strassman saw the card, she was so shocked. She really liked the card and my friend would also showcase her other works to her. Karen thought it looked great and it's something that she loves to see. 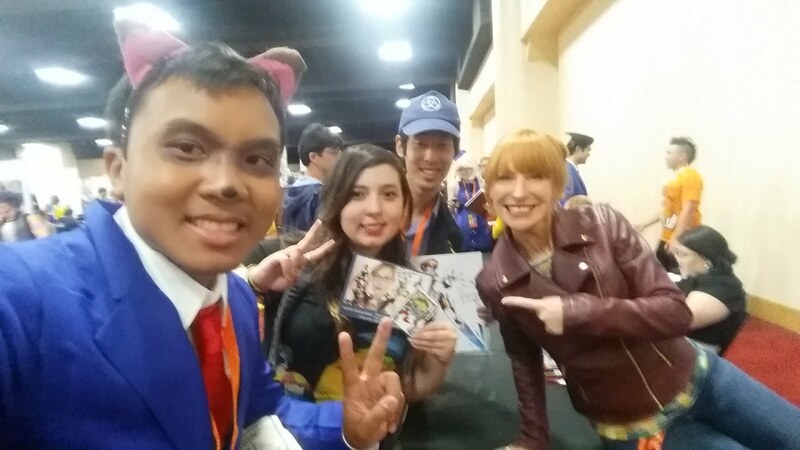 She would sign the card for my friend as well as a couple of stuff from me (Aigis and Nanako Weiss Schwarz cards and the Fire Emblem Fates artbook with a picture of Hana). We also did take a selfie with her. 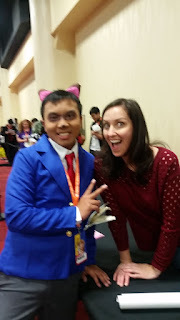 She was a really nice person and me and my friends had a good time hanging with Karen Strassman and we hope to see her at an upcoming convention here in the Bay Area! I met up with my AC friends again where we would take photoshoots of our whole group for most of the time until I met up with everyone else where we would go down to the Chinatown area to a restaurant called Shooting Star Cafe to grab some good tasting waffles for dinner. Weird right? Waffles for dinner? 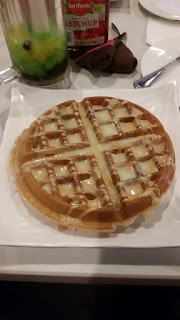 Believe me this place we went to had really good tasting waffles and I digged in right away to this waffle. I even grabbed some fish and chips and had a really good dinner. My friends were right, this is a great place to check out when you're at Kraken Con! Anyone want some great tasty waffles? For dinner? We walked back to Kraken Con to see that the Atlantis Ball that was happening when we had dinner was almost closing down. But all I can see was just a couple of cosplayers dancing as it seems that the rest of the ball participants decided to leave early. With nothing else to do, we would hang at the Gaming Room. I would check out the Gong Show that Robbie was hosting and would hear some pretty entertaining karaoke, just like a certain show of the same variety that you can see at Fanime too. Turns out the show can still rock at Kraken Con. After hearing a couple of singers, I would spend the rest of the con night playing a couple of rounds of Super Smash Brothers 4 before calling it a night and leaving for home. But so far, so good for this convention. I've had a pretty fun time so far and I hope that Day 2 would be as good! Day 2 started off a little early for me as I got ready to cosplay Ken Amada from Persona 3. But this time around, we're not in our usual wear. Instead we're maids and butlers this time around! 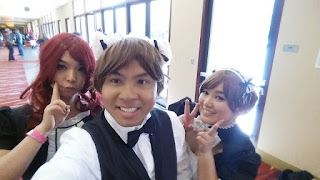 I would pick up our Mitsuru and Minako for our group before heading over to Kraken Con. We would start the day off by checking out more around Artist Alley and Dealer's Hall before taking photos from our photographers. After that, we would go out to grab some lunch, but a pretty light lunch. There was a T4 tea hourse in Chinatown where we replenished with boba, popcorn chicken, and egg puffs. 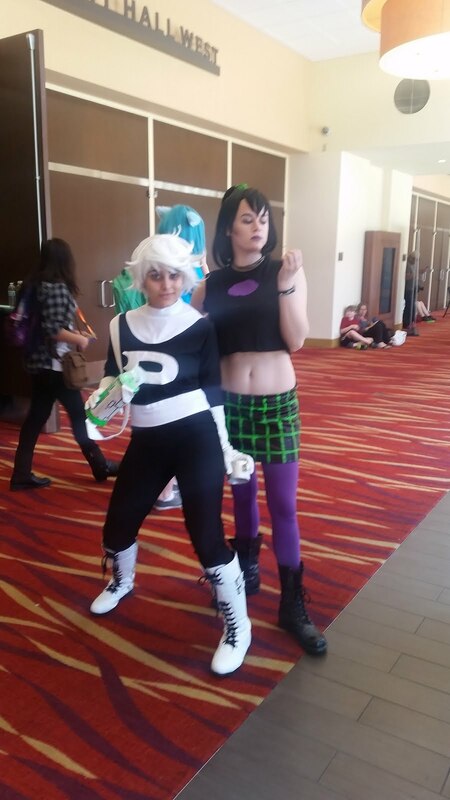 After lunch, me and my friends would change out to casual wear and with only a couple hours left of the con, we would roam around the convention center for one more run around buying artwork and things from the Dealer's Hall before Kraken Con shuts the doors until their Fall convention. I was able to grab a couple of things like a blind box figure and a new Maki Nishikino nendoroid from Love Live, a new Keychain and a Komasan plushie from Yokai Watch, and a Haikyuu artwork. A pretty good turnout for sales because some vendors are selling their items at reasonable prices. At 6, the doors of the convention center is closed and Kraken Con Spring is finished. I would say goodbye to all my friends and then grabbed dinner again at Shooting Star Cafe with those who stayed a little longer. And again, grubbing down on a good waffle! But after that, the convention center was empty; literally. With that in mind, we're going home! Kraken Con Spring is over and the con was pretty remarkable! 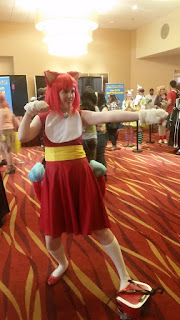 The con has been improving significantly with the newest changes around the con like having new things like Cosplay Senpais giving advice to cosplayers that want to be as big as them and seeing a sense of retro in the Gaming Hall. Besides the usual video gaming with panel TVs, there were arcade-style retro gaming machines. Not only that, but there was air hockey tables. It's like seeing an arcade in the Gaming Hall and I think that's a really good improvement to see. It gives a sense of nostalgia with these types of games around the gaming hall to those who love retro games and gives the new generation some games to check out besides the usual video console games that we play nowadays. With the new expansion that Kraken Con has means more space for dealers and artists. In these sections, each area has been clear for all the attendees like there is a lineup next to the entrance for those who wants autographs, Artist Alley and Dealer's Hall is still in the middle of the con and have been merged but still gives a lot of space to those who walk around, the back of the con is now for promoting other cons close toKraken Con like AsahiCon and SacAnime as well as card gaming, the corners of the con has been used for the Photo Booth and Rock Band, and the side wall that make the split between Dealer's/Artist Alley and the Gaming Room was used for those who are promoting projects like new video games mostly. With this much space, they are looking really well to actually further expand new ideas at this convention center and I can't wait to see what they have in store. Because right now, the con is looking really well. What really sticks out to me is the placement for this con, most particularly the date. 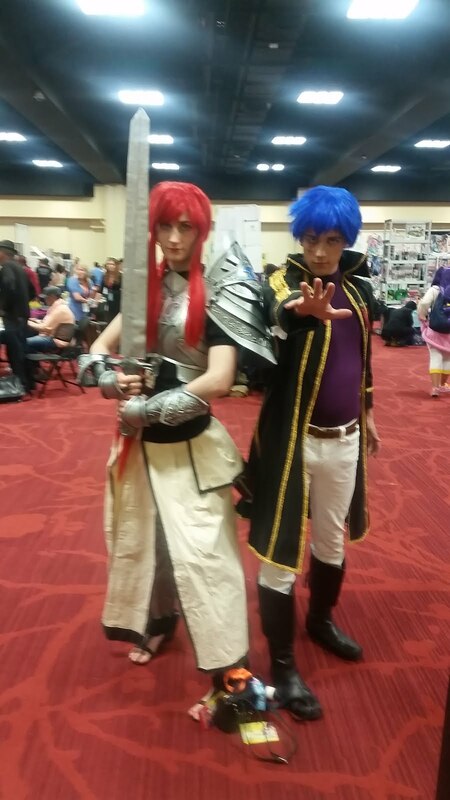 It is during the last week of April, which is about a month away from a bigger con happening in the bay area: Fanime Con. So with a significant con looming soon, how would the attendance rate affect for this con? Apparently a lot to me. I had the sense that there was not a lot of people attending and I think it's because of Fanime is near. If they didn't place this con during the final weeks of what would be "prep time," then I can see the attendance rate go up pretty high. And that means more guests to see how great Kraken Con has been. Maybe March would be good to have this convention at since it's after Animation on Display and a good significant time before Fanime begins. Another thing that affected me in the people. 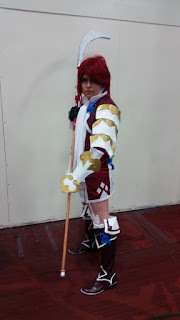 And I'm not talking about the people that are not interested in the con itself, which are those that are outside the con questions why we're in cosplay and why we stand out and all. It's the people inside the con. In this con in particular, there have been some significant people that have been showcasing awkward behavior to the attendees of Kraken Con and they have to lay down a big policy on this. I've heard from one of the staffers that an awkward behaving person was ruining most of the Atlantis Ball and actually creeped out some of the staff that was working the Ball. Another instance from what I've heard from a staffer was that they were on the lookout for a certain creeper in the con. This isn't a good look to have especially for a con like this. I can understand that it's Oakland, it's not really a fine town like San Francisco or San Jose, but it doesn't mean that we can let these people have their way and find it tolerable. There should now be some sort of restriction list to be placed. For example, if a certain person has been marked down by staffers, attendees, or anyone in the con for doing unacceptable acts in the con, they should be warned and if they do it more than twice, they are automatically banned from the con (like a 3 strikes system). 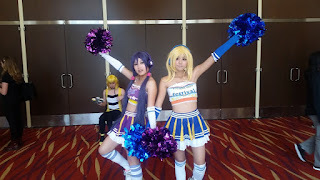 It is a harsh system but the con should have a reputation in giving people a good time as well as not feel awkward with people at the con. Other cons have ban lists, it may be time to start thinking about getting one. Other than that issue, I found no problem with the convention. The Gaming Room looks like there was no conflicts when it comes to gaming tournaments, there were no complaints from Dealer's and Artist Alley, all the panels I went to look great, and it looked like everyone had a great time. I really loved how everything was ran this time around knowing that Autographs was moving successfully and it seemed that the guests love it as well! In fact, no line cons! No waiting for hours for a badge or anything in that matter, everything was running smoothly and I believe this con is going to get better! I can't wait to see what they will be doing for this Fall's Kraken Con! Anyways that all I have to report for this Spring Kraken Con! Next up for me is in a month as I attend Fanime Con 2016! Until then, see you all later!